Google Play Store Optimization (GPSO) or App store optimization is all about getting your app in right category, for right keywords and to the top of category. The top includes under top apps for all apps, top apps for the category that your app falls under, and the top search result when someone searches for a word within your keyword area. Knowing a little about SEO (Search Engine Optimization) can help give you an idea about how to use ASO (app store optimization). 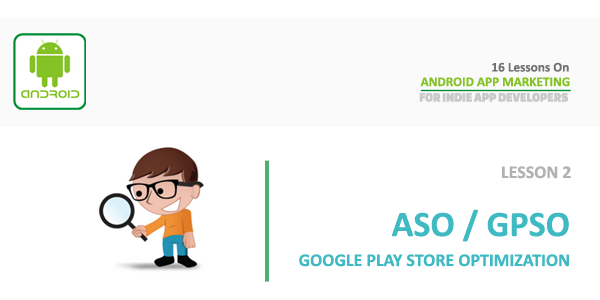 Android app marketing falls right into place with ASO because the better your optimization the more people that will see your app. In order to use ASO properly there are a few things to consider. The first one comes before you even launch your app. The keywords you use to help people find your app are very important for ASO. Due to having a limited amount of keywords, do not use words that are in your apps title. Someone searching your title will still be able to find your app even if the title is not in the keywords. When your app is already launched you will have less power over android app marketing when it comes to ASO. While keywords will help people find your app and can increase downloads, what puts an app on top is the review and download ratio. When someone downloads the app and they rate it they get to choose to rate your game 1 out of 5 (5 being the best). The better the download and good review ratio is the higher on the app store ranking your app will appear. A new app has a good chance of making the top apps even if it is for a short period of time. This is because a lot of people will download the app right away if it was advertised correctly. As long as the app gets good reviews it will shoot right up on the top apps. As downloads slow down for the app it will drop ranks.